This will be one of the heartiest, most satisfying burgers you will ever enjoy! Mix the ground beef, minced garlic, pepper and salt together in a large mixing bowl. Form into four patties. Heat the grill to medium high heat and spray with non-stick cooking spray. Add the burger patties and cook until desired temperature, 4 to 5 minutes per side for medium-rare (or until internal temperature reaches 160 degrees F). Place a slice of cheese on top of each pattie during the last 45 seconds of grilling. Fry bacon in a hot pan to desired crispness. Remove and drain on paper towels; set aside. Wipe most of the bacon grease from the pan and return to the stovetop. Reheat pan over medium setting. Crack four eggs into the pan and cook until yolks are set; remove pan from heat. Lightly brush the sliced ciabatta with olive oil and grill just until lightly toasted. 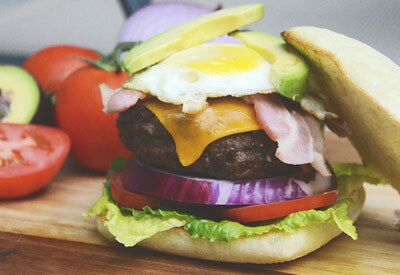 Assemble burgers in the following order: one slice ciabatta, romaine, tomato slices, red onion, burger pattie with melted cheese, two slices bacon, fried egg, avocado slices and top with ciabatta.